Named for the lovely Italian city of Siena, the Sienese (Siennese) stitch is an easy, wide-line stitch in the generic looped-stitch family. The first examples of this stitch and the resulting distinctive Sienese embroidery were shown at the Siena Samples Fair in 1921. At the same time, Maria Martini Mari, then president of the National Council of Italian Women, created the Committee of Ars Senensis, which eventually developed into an organization promoting women’s work in an effort to improve the economic situation of the women who did the work. Sienese embroidery consisted of the new Sienese stitch in combination with the rush stitch (a couched-thread stitch) and several other stitches worked on a thick, coarse background fabric of a natural color. The stitching generally was worked with blue, black, or rust threads. The designs for the embroidery were inspired by the paintings by Sienese artists, the stone fragments of flowers and animals from the monuments in the church of St. Antonio, Roman bas-reliefs, and ancient palaces and other medieval buildings in Siena. Each Sienese stitch is composed of two parts: a straight stitch and a second stitch of the same height looped around and placed in the center of the first stitch. The results are a finished stitch that resembles the letter “K” (Figure 1). The looped stitch should be pulled snug but not so tight as to distort the straight stitch. You may need to hold this loop with your thumb to keep it in place while working the next stitch. Work a row of Sienese stitches between two parallel horizontal lines from left to right (Figure 2) or work a column of stitches between two parallel vertical lines from top to bottom (Figure 3). The spacing between and the height of the two legs also may vary (Figures 3, 4, and 5). 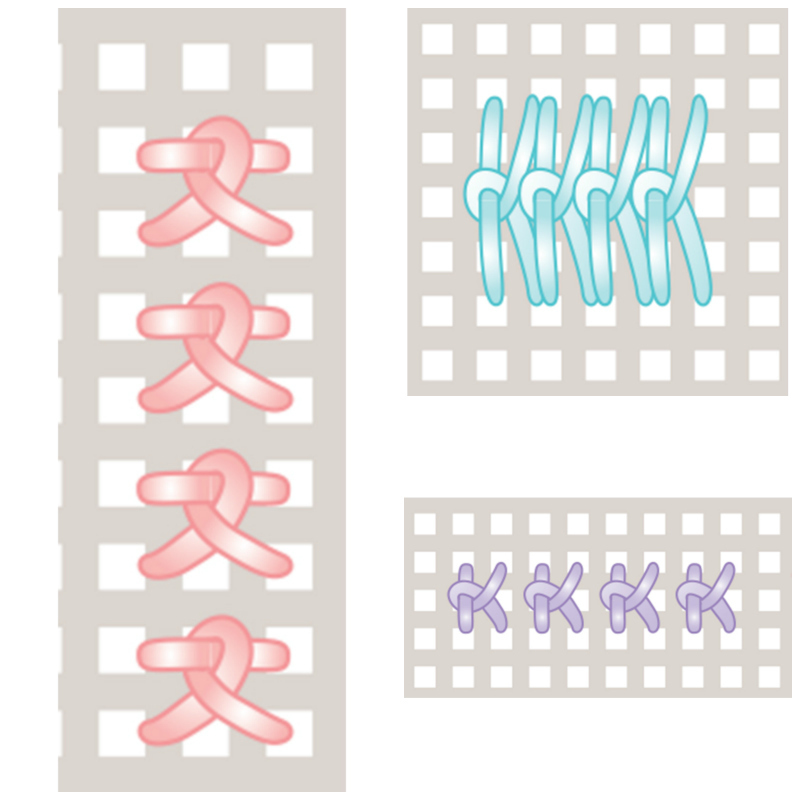 Individual Sienese stitches may be placed touching each other to create a compact, ridged line (Figure 4), spaced one thread apart (Figure 5), or spaced even further apart for a more open appearance (Figure 6). Although a few references indicate that the Sienese stitch is suitable only for straight lines, try stitching curvy or wavy lines by stairstepping the stitches up and down (Figure 7) or by placing the stitches closer together on the inner edges and wider apart on the outer edges. A row or column of Sienese stitches normally is spaced at regular intervals along this line. These stitches, however, could be in groups of various numbers and alternate between unworked areas (Figure 8). This attractive but simple stitch may be used for bands, borders, or as a multiple- row filling stitch on either evenweave fabrics such as linen, Aida, Jobelin, and Lugana, or nonevenweave fabrics such as muslin, satin, or wool. If a nonevenweave fabric is used, lightly mark the height of the stitch with parallel guidelines using a pencil, chalk marker, or water-soluble pen to keep the line of stitches tidy and the same height. Any type of thread, braid, or ribbon may be used as long as it’s appropriate for the background fabric. A heavier thread, or a more tightly twisted thread such as pearl cotton, however, will make the central, looped ridge more distinctive. Although each Sienese stitch generally is worked in one thread color, there is no reason that it could not be done in two colors of thread—the straight stitch in one color and the looped stitch in another. If using two colors, stitch all of the straight stitches first in one color and then follow with the looped stitches in the other color, or, using two threaded needles, work consecutively and complete each stitch before proceeding to the next one. Although the Sienese stitch is relatively unknown and little used, it is quick, easy, and fun to stitch. Consider adding it to your bank of stitches used for samplers and other decorative embroideries. This fourth installment of Deanna’s stitch tutorials originally appeared in the July/August 2002 issue of PieceWork, along with instructions for stitching an Adam and Eve sampler. Deanna is PieceWork’s needlework technical editor; she previously was the editor of The Needleworker magazine. Stay tuned for more stitch tutorials from Deanna in the weeks ahead! Read the entire “Stitch in Time” series!